"2018 and 2019 Trip Advisor Top 25 Bed and Breakfast In the U.S.!" Named ILoveInns.com 2019 Top 10 most Romantic B&B! 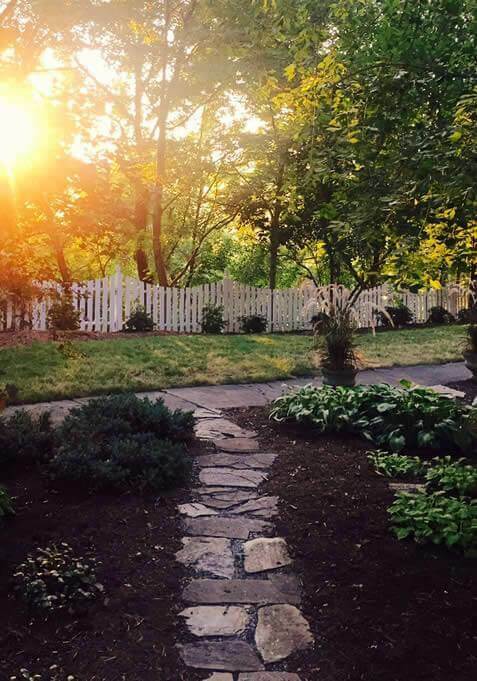 For the second year in a row, Oak Hill on Love Lane Bed and Breakfast has received the Trip Advisor Travelers Choice Award and has been named one of the TOP 25 BEST BED AND BREAKFASTS IN THE UNITED STATES! The 2019 Trip Advisor’s Travelers Choice Award lists Oak Hill as the #11 Bed and Breakfast in the U.S.
Winter is the perfect time to visit the Mountains of Western North Carolina! Enjoy a hike on the Blue Ridge Parkway, and then come back to Oak Hill for a hot drink or glass of wine in front of one of our cozy fireplaces! Take advantage of Holiday Season and Winter Specials! BOOK NOW! AMAZING LOCATION, UNPARALLELED SERVICE, ULTIMATE COMFORT! Western North Carolina and the Asheville area are becoming one of the top vacation destinations in the country! A visit to Oak Hill on Love Lane Bed and Breakfast, the BEST BED & BREAKFAST IN WAYNESVILLE, is an experience you will never forget! Whether you are looking for a romantic location to celebrate an anniversary or honeymoon, planning an outdoor adventure, or just need to get away and relax, you have found the perfect destination! Explore all of Western North Carolina and Asheville from one central location! 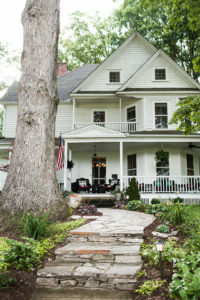 Nestled in the Smoky Mountains, Oak Hill on Love Lane Bed and Breakfast offers beautifully decorated accommodations, magnificent mountain views, three course breakfasts, (including our famous “Meandering Muffins”), daily home-made cookies, luxurious linens, and locally hand-made lavender bath products just to name a few! The lovely historic inn is centrally located in Waynesville, NC, just 30 minutes from downtown Asheville to the East, and 30 minutes to The Great Smoky Mountain National Park to the West. Just 20 minutes to the south is the Pisgah National Forest and 7 miles West the Blue Ridge Parkway. Enjoy a myriad of activities including waterfalls (about 250 within an hour of the inn), hiking, biking, fishing, rafting, golf, 5 national and state parks and forests, The Biltmore Estate, local art, dozens of museums, and festivals galore! 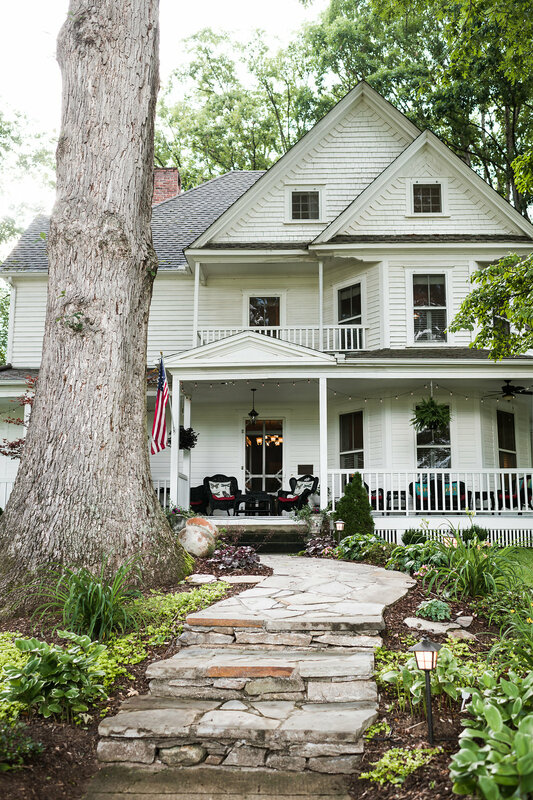 Oak Hill on Love Lane Bed and Breakfast overlooks the quaint town of Waynesville and is just a half-mile walk to the wonderful shopping and dining on Main Street. 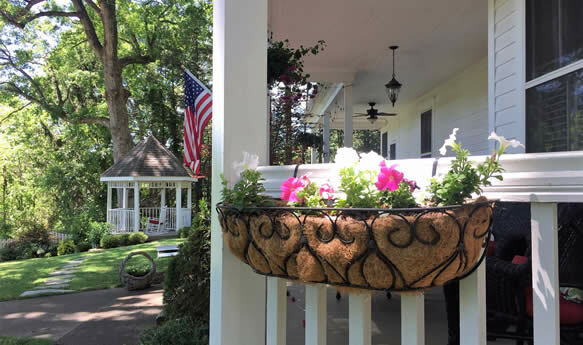 Make your reservation today and then get ready to relax on one of our outdoor porches and enjoy the Smoky Mountain views, reserve a romantic in room couples massage, take a drive and go hiking or biking along the Blue Ridge Parkway, or tour the Biltmore Estate in Asheville! Whatever type of vacation you have in mind, Oak Hill on Love Lane Bed and Breakfast is the perfect location for your next mountain getaway in Western North Carolina! Selected as Best in the South in the annual Best of BedandBreakfast.com Awards, 2009-2010. Trip Advisor’s 2018 Travelers Choice!